Lean Six Sigma is a comprehensive and highly effective strategy for achieving and sustaining business success. Lean Six Sigma delivers bottom line savings, project by project, in an organised, proactive and highly transparent manner. Lean Six Sigma is driven by a close understanding of customer needs, disciplined use of knowledge, facts and statistical analysis and diligent attention to a methodology to improve or reinvent business processes. 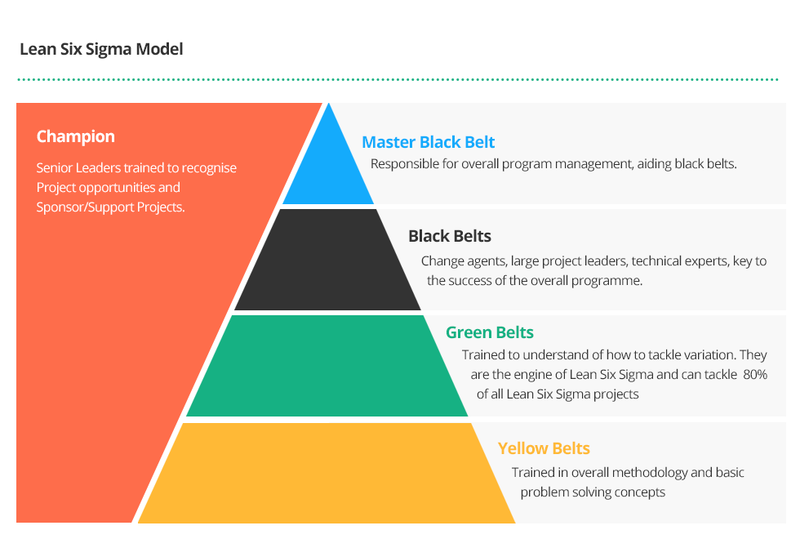 Our Lean Six Sigma Black Belt programme is a 12 day programme. The unique feature of our programme is that certification is only achieved on completion of a major project, documenting application of the learning tools and evidence of the savings generated. Projects completed by delegates who have attended SQT’s Lean Six Sigma training courses have yielded significant cost savings, (in excess of €40 million), for Irish industry leading to increased competitiveness/improved job sustainability/company viability. Typical Lean Six Sigma Black Belt for Service and Transaction projects are yielding savings of €100,000 per project. This project forms a major part of the training process as it is only by ‘doing’, that people really learn the tools and techniques of Lean Six Sigma. For this reason our training is specifically designed to be very practical and hands-on so that delegates, once they achieve Black Belt status, can go on to lead major improvement initiatives and drive lasting change within their respective organisations. You must start by focusing on the customer and identify their critical to quality requirements. You must ensure that your processes are designed and managed to meet these key customer requirements. There must be appropriate measurements in place to understand how well you are meeting customer requirements and more importantly, how well the customer feels you are meeting their requirements. You need to involve your people, ensuring they are effectively equipped (trained) so that they are able and feel able, to challenge their processes and improve the way they work. Improvements are implemented project by project, using a systematic, data driven, problem solving and process improvement approach. No change happens without the correct Leadership, Support and Management Behaviour, this is the real key to Lean Six Sigma success. 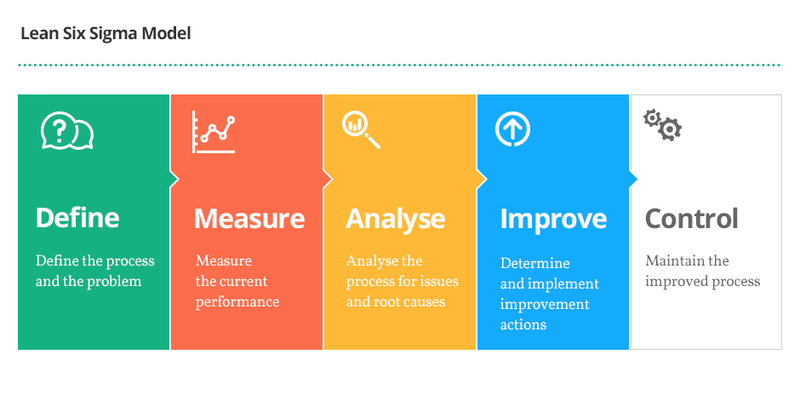 What Impact Can Lean Six Sigma Methodology Have On ‘Transactional Processes’? To successfully launch a Lean Six Sigma project by defining a project, assembling a project team, garnering support for the project from process stakeholders and ensuring a common understanding of the process across all project participants and stakeholders. The aim of the programme is to produce graduates who possess advanced knowledge of theory and practice of Lean Six Sigma to enable them to establish and/or take leadership roles in process improvement efforts in service & transactional organisations. Be able to confidently engage in and successfully resolve process engineering projects in both the technical and managerial aspects and communicate effectively their resolution. Demonstrate the ability to overcome resistance to change and embed such improvements within a service and transaction environment where sustainability is highly dependent on employee and cultural engagement. A person who has demonstrated the achievement of this level by approved prior experiential learning (APEL). A laptop with the most recent version of SigmaXL software. (On Public courses, this software will be supplied to delegates by SQT and is included in the course fee. 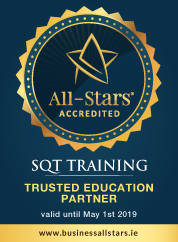 On In-House courses, SQT can supply the software licences if required or should your organisation currently use an alternative software package (such as SPCXL or Minitab) this can be used. For applicants whose first language is not English, SQT recommends a minimum English language competency of IELTS 6.0 (or equivalent) for successful completion of this It is important to note that learners are not expected to have an IELTS or equivalent examination complete. Potential delegates are expected to self-assess their English language competency against the IELTS Band scores which can be found in this document. Delegates are required to complete an individual Lean Six Sigma Black Belt project. 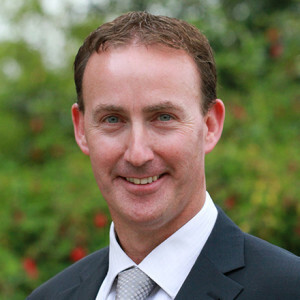 A strategic and comprehensive project must be identified in advance of training which, once successful, will deliver real improvement and tangible savings of €50k annualised. All elements of the assessment must be taken and Learners must achieve a minimum of 40% in the Written Project Report and Project Oral Presentation and must achieve a minimum of 40% in the overall assessment. During each module of training, Black Belts get the opportunity to present their project to the group thus developing their presentation skills as well as demonstrating and re-enforcing their knowledge of the tools and techniques. This forms the Project Continuous Assessment. Several months after the final training session Black Belt candidates will be invited to present their completed projects to a panel. Delegates have the opportunity to invite their Project Champion/Management representatives from their own company to the presentation. Comprehensive guidelines will be given during the course to all delegates. The delegate has up to 12 months following training to complete their final written project report. This course is a taught course over ten days. Delegates then complete an individual Lean Six Sigma Black Belt project. 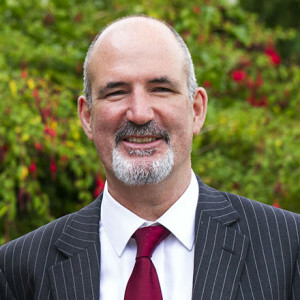 A strategic and comprehensive project must be identified in advance of training which, once successful, will deliver real improvement and tangible savings of €50k annualised. Delegates have up to 12 months following training to complete their final written project report. Lean Six Sigma Black Belt Training is challenging in terms of content and time requirement. A ‘rule of thumb’ for QQI validated programmes is that one credit is equivalent to approximately 25 ‘learner effort hours’. ‘Learner effort hours’ include training days, time spent at project, time spent studying/reading, learning on the job. Throughout the training and right through to project completion, Black Belt candidates will receive support and mentoring from their tutor. For companies embarking on a Lean Six Sigma deployment, a 1 day ‘Introduction to Lean Six Sigma’ and a 2 day ‘Lean Six Sigma Champion’ training is available for company personnel, as required. This course is validated by QQI at Level 8 on the National Framework of Qualifications (NFQ). Successful delegates will receive a Special Purpose Award, Certifcate in Process Engineering (40 Credits). This programme can be used as a basis for applying for ASQ (American Society for Quality) certification. Delegates can sit the ASQ Black Belt certification examination. Some further self-study will be required. ASQ certification is a formal recognition by ASQ that an individual has demonstrated a proficiency within, and comprehension of, a specific body of knowledge. All QQI accredited programmes of education and training of 3 months or longer duration are covered by arrangements under section 65 (4) of the Qualifications and Quality Assurance (Education and Training) Act 2012 whereby, in the event of the provider ceasing to provide the programme for any reason, enrolled learners may transfer to a similar programme at another provider, or, in the event that this is not practicable, the fees most recently paid will be refunded. If transferring to another provider to facilitate programme completion, all learner records will be transferred. When is Black Belt Training a waste of your time?